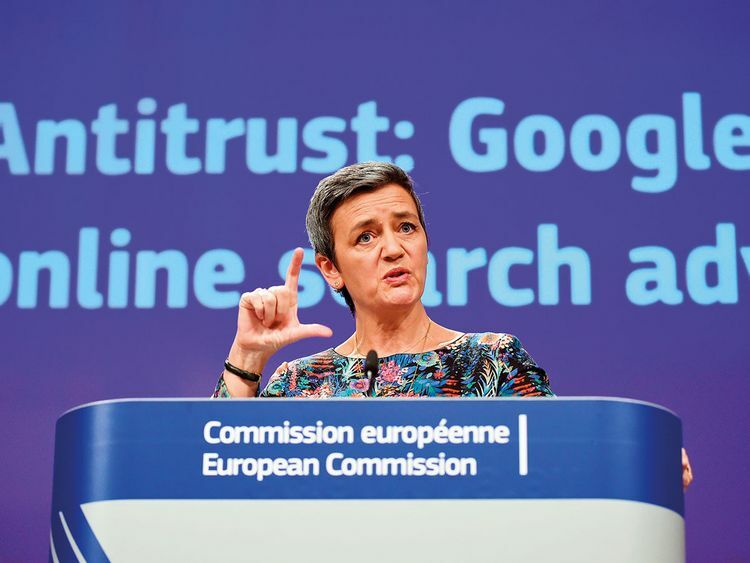 Europe’s fine of 1.5 billion euros (Dh6.28 billion) on Google for antitrust violations in the online advertising market continues its efforts to rein in the world’s biggest technology companies. The fine is the third against Google by the European Union since 2017, reinforcing the region’s position as the world’s most aggressive watchdog of an industry with an increasingly powerful role in society and the global economy. The regulators said Google had violated antitrust rules by imposing unfair terms on companies that used its search bar on their websites in Europe. The European fines against Google total roughly 8.2 billion euros, (or Dh34.16 billion; $9.3 billion. But the bloc has not received any of the money yet; Google is appealing the earlier decisions, and is mulling whether to appeal the most recent ruling. The fine centres on contracts that license the use of Google’s search bar on websites run by newspapers, blogs, travel services and other companies. European regulators said the operators of the third-party websites using Google’s search bar had been required to display a disproportionate number of text ads from Google’s own advertising services over competing digital advertising companies. The practice, regulators said, undercut competitors such as Microsoft and Yahoo, that were trying to challenge Google in search. 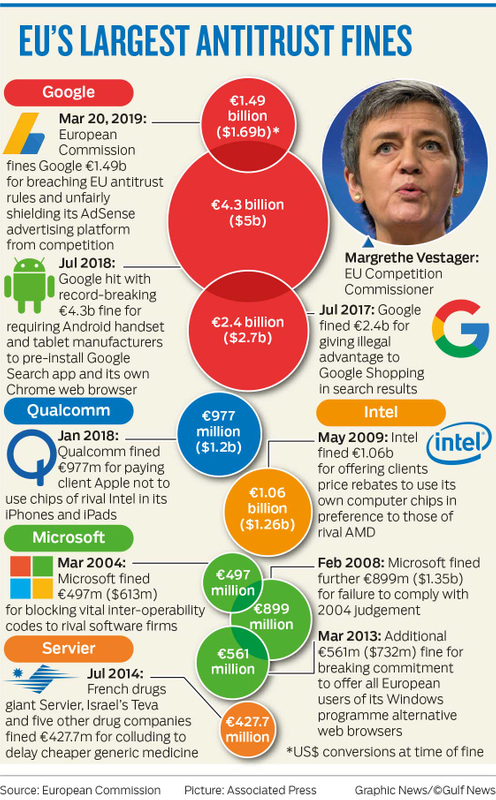 “There was no reason for Google to include these restrictive clauses in its contracts, except to keep its rivals out of the market,” Vestager said. She said the ruling covered 2006 to 2016, when Google stopped the practices. “As it becomes increasingly clear that antitrust fines or after-the-fact remedies are not enough to bring vibrant competition to the market, governments will need to move to deeper tech sector regulation to remedy problems,” said Gene Kimmelman, a former antitrust official in the US Justice Department. The European Commission pursued three investigations against Google. Last year, it fined Google a record 4.34 billion euros for using its ownership of the Android mobile operating system to unfairly undercut rivals in the mobile phone market, a decision that also forced the company to change how it bundled its apps on smartphones. In 2017, the company was fined 2.4 billion euros for unfairly favouring its own shopping services over those of rivals. The two previous rulings have not had a big effect on Google’s financial health, but they have forced the tech giant to adjust some business practices. After the Android ruling last year, Google for the first time began charging handset-makers to pre-install Gmail, Google Maps and other popular applications for Android devices in the EU. Perhaps in an attempt to head off additional inquiries, Google announced a number of further changes to services across Europe on Wednesday, after rivals complained that it continued to benefit from anti-competitive business practices. For the first time, the company said, it will ask Android phone users in Europe if they want to switch to a web browser and search engine not owned by Google. To allow more competition when customers shop with Google, it will give other shopping sites more prominence in its search results, the company also said. Google said it would do the same with local search queries in Europe, such as when a person searches for a restaurant, a move that could help companies like TripAdvisor and OpenTable. The EU is expected to adopt new copyright regulations as early as next week that would impose restrictions to stop unlicensed content, like music and videos, from being shared on tech platforms like Google and Facebook. Regulators across Europe are pursuing several lines of inquiry. Amazon is under investigation for its treatment of independent sellers who use its website to reach customers. Apple, which in 2016 was ordered to pay Ireland $14.5 billion in back taxes, is now under scrutiny for its App Store policies. Facebook is facing separate inquiries related to its business practices and handling of user data. Google’s advertising practices are also being monitored by privacy advocates who are urging regulators to begin a new investigation for violating privacy rights.